Jason picked up Batman Incorporated #5 this week because, despite a solict that didn't mention her at all, the issue has a healthy helping of Batwoman-goodness! Plus a cover by J.H. Williams III! So go back to your local comic book shop and pick it up! 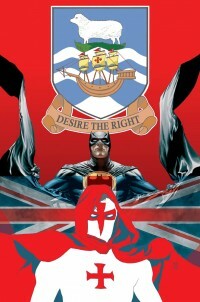 Batwoman is the greatest!!! Plus this week we get the conclusion to what is essentially X's super-violent Avengers fanfiction. 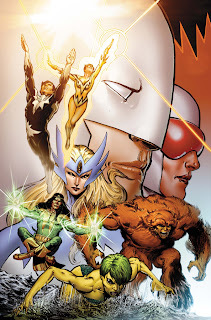 Given that this is just a imagined history perpetrated by a mental construct (i.e., nothing's at stake in 616's reality) and we know that the Avengers don't appear in the earlier AoX chapters, I'm guessing that the Avengers meet an untimely demise in this issue. But watching the X-men crush the Hulk, the Winter Soldier, the Invisible Woman, Spider-Woman, and Iron Man's re-animated corpse is gonna be frakking awesome! Diana has finished her trek through her past selves with Dr. Psycho which means one thing: it's time to bring the pain to the Morrigan! And with the next three issues' covers feature a mash-up of old and new Wondy, so it seems like we'll be seeing the old Diana more and more! The JMS story begins its final act this week; be sure to jump on for the beginning of the end of Wonder Woman's new beginning! We're back this week talking about all that is not X that came out last week. We chat about Batgirl, the Legion of Super Heroes, Wonder Woman, Avengers: The Children's Crusade, and much much more! Also, check out my ultra-cute Mudkip hoods that I made! I heard you liek them! :P You can get them on Etsy here. Check it out at Newsarama! Man down! Guido has been struck down by Ballistique's bullets! Which, we have found out, are not weird destruction vectors that come from her fingers and are therefore able to break bullet proof glass and puncture people whose mutant ability is to absorb kinetic energy, but are in fact real life, solid, able-to-be-turned-around-by-telekinesis, (but also they are magic?) bullets. Well. I'm sure we'll get an explanation. Right Peter David? Gosh I hope so... Also Ricstar! Hot Eric and Pam cover!!! Hey, did you all see Anna Paquin in Scream 4? Best scene ever, right??? LOVED. IT. Back to comic books: Jessica is still in trouble, which means Sookie is just very, very bad at saving people from poisoning. Quelle surprise. So she runs to Eric. The quelle suprise-est. Lafayette wasn't mentioned in the solicits, but if you're a True Blood fan you can pick this up today (instead of waiting for Game of Thrones to finish). Thank gosh only the TV show is scheduled behind that constantly-delayed fantasy behemoth, am I right? This one is definitely adult! 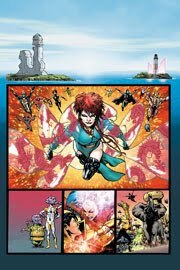 But it also includes the "genre-bending" (the solicit's words, not mine!) qualities of action and adventure! In other words: "This ain't no Chi Chi feature, expect (some) plot!" And, also, expect the strict, conformist gender roles of uke-seme heteronormativity!!! #awesome? Oh, yeah, and Angel is ending its run on IDW. There's gonna be a coda issue next month too, but basically this is the end of the road folks! Next stop... twilight! Despite there being less mutants nowadays, there seems to be more X-books than ever. It looks like we're going to be designating X-clusive episodes for the X-men releases. 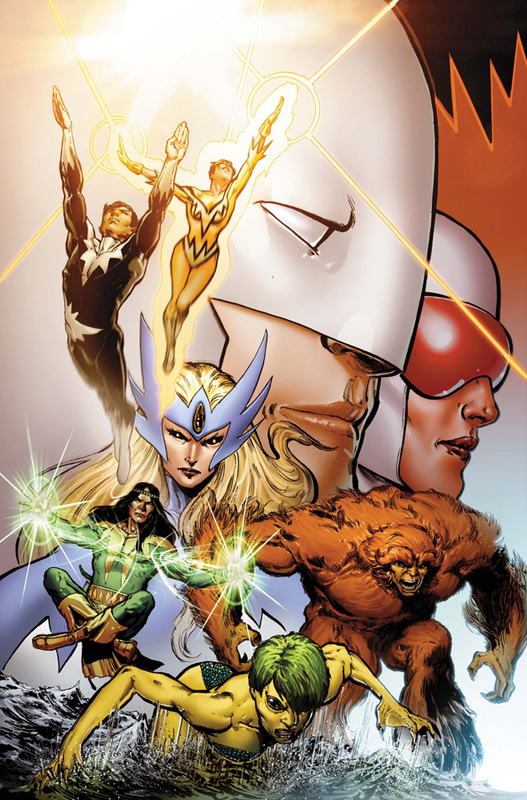 To be fair the X-men have isolated themselves on Utopia, so I guess that makes sense. Today we talk about the newest in Daken: Dark Wolverine vs. X-23, Uncanny X-men .1, Age of X (Universe and Normal story). Wolverine's Teen Girl Squad Go! So I've been saying that Marvel needs to make a book just about Wolverine and his teenage girl sidekicks. 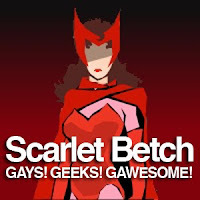 From the original Kitty Pride and the overly-reviled Jubilee, to his clone/daughter/sister/niece X-23 and the Whedon conceptualized Armor; this would be a fantastic book full of blood, mayhem, and sleepover pillowfights. Bloody, bloody pillowfights. 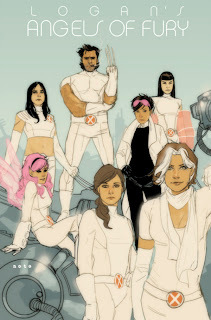 Evidently Wolverine & Jubilee artist Phil Noto was thinking the same thing and produced this lovely piece of work. Please, Marvel gods above. If you see this... MAKE IT HAPPEN! Uncanny X-strogen? Logan's Angels? I'm personally a big fan of Wolverine Teen Girl Squad Go! Go check out Project Rooftop for the full-sized pic! The misadventures of Gravity Kid and Power Boy, as well as of the not-gay Legionnaires in-training, continue! Basically Grav Kid and the freshmen are being schooled by the villains who took out Chemical Kid's family while Power Boy and the upperclassmen are dispatched to check up on them (if I remember correctly...). ANYWAY, FINGERS CROSSED FOR BOY KISSES!!! So the big Wolvie-spin-off-character fight went down last issue of X-23 and this week X-23 and Daken are teaming up! Of course, I'm sure Daken has some nefarious ulterior motive, because he's Daken and that's why we love 'im. Gambit guest stars as well, so FINGERS CROSSED FOR ("The-guards-are-coming-quick-kiss-me-so-they-don't-recognize-us,-Gambit! "-whispered-Daken) BOY KISSES! YOU CAN'T THROW SOMETHING THAT YOU CAN'T TOUCH!!!!!!!!!!!!!!!!!!!!!!!!!!!!! There are only a few celebrities which have my undying and boundless devotion. One of them is George Takei. The openly gay, groundbreaking and path paving actor who starred in the original Star Trek series as Lieutenant Hikaru Sulu has made an indelible mark on American culture. His coming out only further endeared him in my heart. And having met George in person, I can say that he is the most amiable celebrity that I have met. This recent video which includes some obvious musical plugging is nothing but utter joy and hilarity. My favorite part is when George defeats Venom with a "KABUKI!" sound effect. GOLD. OMG, it's been 8 months since this story started! Remember when Magneto kidnapped our heroes from the Avengers mansion? Yeah, me neither. This book is like the anti-Brightest Day! It has characters who are not straight white men but it is NEVER published! Come on, Marvel. Jim? Allan? Can't you think of adding some tie-ins at least? That Iron Lad-centric one shot last month was AMAZING! Why can't we get a "Generation Lost"-type story to run parallel to this one? Seriously, just publish one shots of Billy and Teddy's dates every other month and my pay check is ALL YOURS. But until you get to publishing that certain-to-be-GLAAD award-winning series I'll just have to stick to re-reading Children's Crusade over and over again and then googling up some fanfiction... sigh... #BOOKOFTHEMONTH!!! A lot of cool stuff is happening with Fig and Cain, but they're lost in comic-book-space-time and in need of rescuing. I'm predicting that Tursig will be rallying Fig's friends this month to form a rescue party! 'Cause he's like this rockin' general and stuff now! And maybe he'll find a hulking gay ogre friend! #fingerscrossed Anyway, it's a good title on its own merits too, so even if it's gay-goblin-deficient this month it's still a good buy! We're back with part 3 of our podcast triad we recorded last week. With all the hubbub that has been drummed up recently regarding Wonder Stripper Woman and her revamped, less cheap outfit for the Titanic-reminiscent NBC series, we thought it would be good to recap some of what's going on with our favorite Amazon in the DC Universe. Recap... rant... it's all the same thing right? The Thundercats trailer is up and it looks AMAZING!